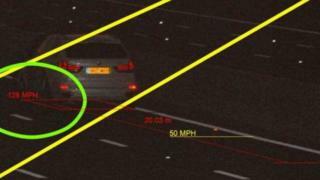 A man caught speeding at 128mph through a 50mph roadworks area on the M1 has been banned from driving for 12 months. Amir Nazari's BMW X5 was clocked driving 78mph above the speed limit between junctions 28a to 35a, near Duckmanton, Derbyshire on 24 May. He was driving at the equivalent of more than a mile every 30 seconds. Nazari admitted speeding at Southern Derbyshire Magistrates' Court in September and was sentenced on Monday. Sgt Nick Beeston from Derbyshire Police, said: "Nazari was driving 78mph over the speed limit and could have seriously put the lives of others and himself in danger. "We went to great lengths to track him down to make Derbyshire's roads safer." Nazari, 39, of Enfield, London, was also fined a total of £649 by magistrates.